With a working range of up to 50 feet, a CLASS 2 Laser with a maximum human output of 4 Milliwatts, you can deliver your presentation with confidence and the freedom to move around without having to return back to your Computer or Laptop to go to the next slide with this compact and lightweight Powerpoint remote. 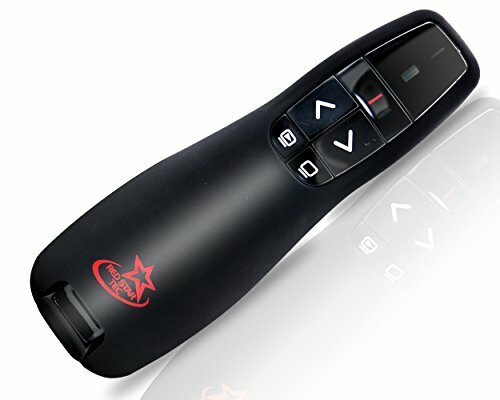 Best of all, no wires or pairing is required with this Red Star Tec wireless presenter remote and therefore no last minute hiccups. Rather you will have total control of your powerpoint presentation. The Presenter comes with a wireless receiver housed within the presenter itself. So you are less likely to lose your receiver. To get started are you need to do is insert your wireless USB receiver into 1 of your USB ports ensure that the receiver is recognised by your computer and then you are ready to go ( Truly Plug and Play) Every thing is intuitive and works exactly the same way for Macs and PCs. Included is a powerful Red laser pointer that allows you to highlight key points and areas in your slide(s) easily. You can also use the laser pointer as a stand alone pointer if desired. when it comes to delivering talks & presentation, all these features make the RST PR-819 PPT Clicker the perfect remote for speakers, students,teachers and Lecturers. COMPATIBLE with Mac's and PC's so your Powerpoint / Keynote presenter will work on any device or Operating System . Try it on your Macbook,Desktop or Laptop. No software needed and so the clicker won't let you down. Just PLUG & PLAY and Boom!!!... You are good to go. This REMOTE IS AN IDEAL SOLUTION for NEW MACBOOK PRO's that no longer support the old infrared apple remote device. WHETHER you are using POWERPOINT, KEYNOTE or even GOOGLE SLIDES,with this wireless presenter everything will run smoothly. You won't need direct line of sight to your Laptop, MacBook or desktop. Become liberated, feel confident and authoritative. Connect and engage your audience as you are no long chained to your computer. If you have any questions about this product by Red Star Tec, contact us by completing and submitting the form below. If you are looking for a specif part number, please include it with your message.